I have a tendency to want to understand an entire journey before beginning down the first path. I am an over-thinker and over-analyzer, with a brain that always wants to comprehend it all. This can be a strength, but it can also be a paralyzing force of inaction. Last week, I wrote about the chrysalis, about the way a caterpillar must dissolve its own body before it can be transformed. Yet even after that death, the butterfly's act of trust is not yet complete. A butterfly forms its wings inside the cramped dark space of the chrysalis. Appendages designed to spread wide crash against the barrier of their growing space and must tuck in before they can stretch. Does the butterfly wonder, in those days, whether it has made a mistake? Can the butterfly imagine, while in its confinement, what it will feel like to ride on the winds of the dawn? Could it comprehend even if it wanted to? The butterfly must form the wings it knows it was meant to have long before it can see what it means to fly. Even when the butterfly emerges from the chrysalis, it cannot yet fly. The wings are soft and crumpled from their formation in the narrow place. The wings must expand, dry out, and receive new blood flow before they are ready to whisk away into the sky. Throughout the process of transformation, the butterfly must trust that it is on its way to a future it was designed to live, without knowing what it will be like to live it. The wings give hints to a destiny different from the crawling of its past, but it cannot fully comprehend what it will be like to use them. 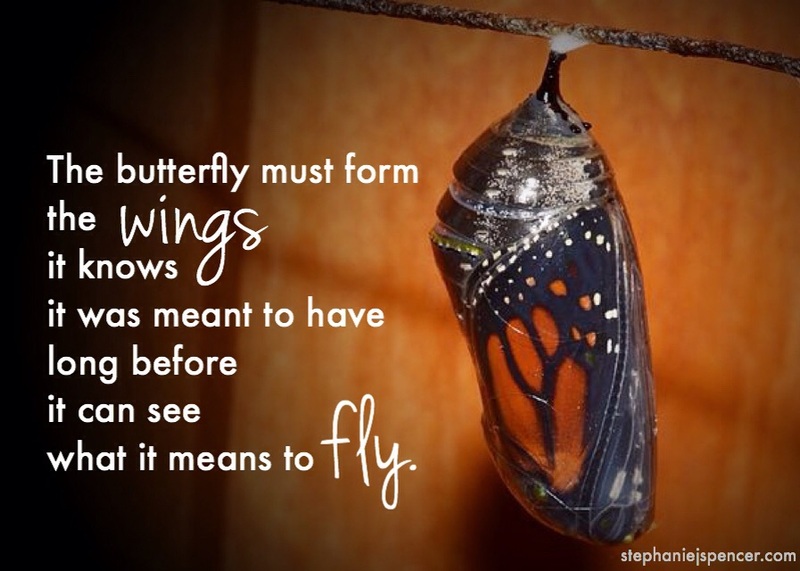 The butterfly can only experience and live into each step of transformation as it comes. I am learning to let go of comprehension. I have felt the urge to allow wings to form, but have resisted, thinking I needed to know where they would lead. How foolish to think I could understand what it means to fly while still inside the chrysalis. This is what transformation feels like: dying to the life you have known in order to move into a life you do not understand. Trusting that you will know what you need to know when you encounter each next step. Instead of worrying about what is coming in the flight, I am getting excited to grow my wings.